I met him when I was seventeen. M was a friend of a friend, and I picked the two of them up with other friends to give them a ride to a home football game. I was always giving people rides because Scarlet, my 1974 Jeep Wagoneer, was generous in space and opportunity for story. People wanted to go places in that Jeep. When the second trimester rolled around, M and I ended up in the same physics class. We got to know each other through learning physics, and though the subject was very difficult for me, I loved the class. It was so fascinating. It was why everything worked. We had a passionate, very funny teacher who recognized my struggle and struggled beside me to find ways I could learn in his class: he bought a book for me titled something along the lines of Physics for Humanities Students, he used me as an example in all demonstrations involving electricity (I received a near-weekly electrical shock in that class), and he made sure to still be at school at 4pm when I needed him to be there. Right after school let out, I (often accompanied by M) would go straight to Denny's and get jacked up on bad coffee while working furiously on physics homework. If I got it done by 4pm, I'd head back to school, and Mr. K would be there waiting to go through my work with me and guide me where I went off track. I would then have the evening to make corrections so I would have quality homework to turn in the next day in class. M and I enjoyed each other in part because we were both so excited about learning. After starting the love letters that he left in my locker with "Dear Tiger," or sometimes just "Grrrrr," he'd go on to tell me something fascinating that he learned or why he liked the project he was working on in his history class. Our relationship wasn't entirely academic, of course. We spent hours in Scarlet making out and making each other laugh. I remember collecting a group of friends and all of us heading to a sledding hill well after the lift closed and the flood lights shut off. We snuck into the park, dragged the tubes up the hill ourselves, and hurtled over and over down in the velvety dark. Our laughter eventually attracted a pebbly-faced, slow-talking security guard on a snowmobile who escorted us out. That Christmas, I gave M a careful pencil portrait of Scarlet, all shiny chrome and seventies weighty steel. In each other, we saw curiosity, creativity, humor, determination, and a whole lot of high-energy fun. Though it may sound like I have some romantic longing for this boy from my past, I don't. Our relationship was necessarily short-lived. Though so kind and curious, even at his young age he already had some demons he hadn't yet figured out how to set free. When M and I were finished soon after Christmas, I was confident in our relationship's end. Though I don't still carry a torch for him, I do for someone else: Tiger. Until yesterday, I owned a 2007 black Yaris, one that was stripped down, free from cruise control, antilock brakes, and power windows, and what little the car did have was manually controlled. In this car, I drove across deserts and through mountains. It was my mini farm truck, and it hauled manure, lots and lots of manure that I used to build my garden and orchard. It was perpetually dirty and not very comfortable. I appreciated this car, and when I first got it, I really liked it. But, there was never any passion. The Yaris was all serviceable efficiency, small and necessary. I donated the Yaris. A large-grinned man came to my house yesterday, hooked it up to tow, and carried it away to auction. It's not pretty, but it runs really well still, and it—hopefully—will be for someone a good, efficient car that will get that someone where that someone needs to go. The proceeds from auctioning the Yaris will go to my local animal shelter. Even in its going away, the Yaris is serving. I was able to make this donation because in July I ordered a new vehicle. Unlike when I bought the Yaris, this time I did spring for more than just what was necessary. I bought a vehicle that has removable roof panels so the whole sky can be mine, a build and trim package that will allow me to skitter over boulders and through sand dunes when I so choose, space enough to fill comfortably with people and stories, and a color that makes me happy. 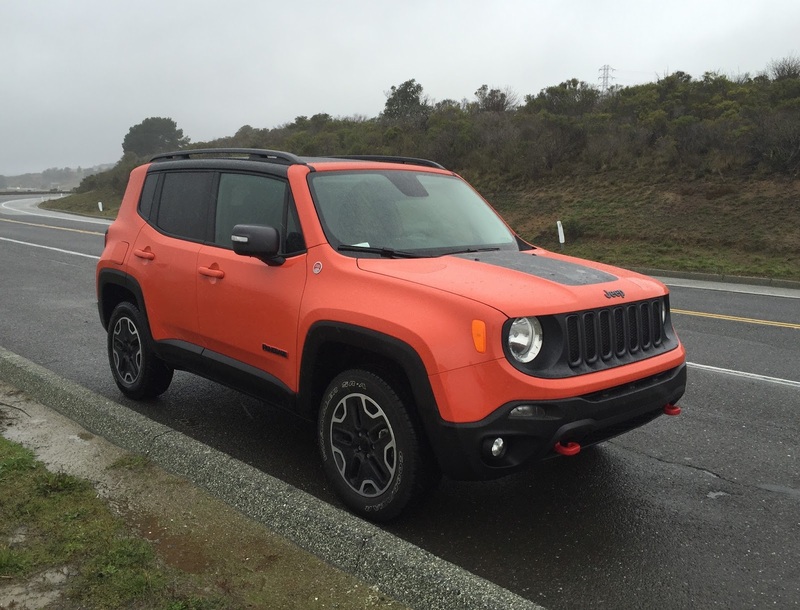 GMC built my orange Jeep Renegade in Italy and took forever to ship it over the Atlantic, across north America, and finally to me. Tiger Lily arrived in December. I can't wait to see what happens in her. Oh, Christina. Though we are an entire generation apart in age, your reminisces on your car brought back sweet memories. In high school I paid my uncle $50 for a 1950 Studebaker wagon. I loved that car. It was old and creaky, and had a hole in the floor under the drivers side through which you could watch the pavement unroll. It carried me, friends, and two St. Bernards all over town for a couple of years. Write your stories (as you do) because when you reach my age, they won't come to mind as readily. Thanks for the memories.